Christmas is over. New Year's is over. We're done with all the "excitement" and well wishes. Hopefully, we can now take a breath. I didn't expect it, but we found that New Year's was just as difficult as Christmas was for us. With good intention, many people wished us a "better year" and made comments like "I bet you're just ready for 2012 to be over with"..."say 'Screw-You' to 2012"...and so on and so forth. But, it's hard for most to understand that that is not how we feel. You see, in all actuality, most of 2012 was the best year of our lives. Our second baby girl was born: we had two children...we had completed our family...our two girls were beautiful and healthy and so sweetly natured. We were set. We were done. We had gotten all that we had wished for. It was the best 9 months of our lives. Seriously. And, then it was ripped from us. And, every day further from those wonderful happy days is just another reminder of the incomplete journey of life that we have ahead of us. It will never be the same and it will never be complete again. The other thing is that 2012 was the last year that Vienne was alive. Staying in 2012 helped us stay closer to her life...memories are fresh and still alive. Starting a new year, is starting something without her. 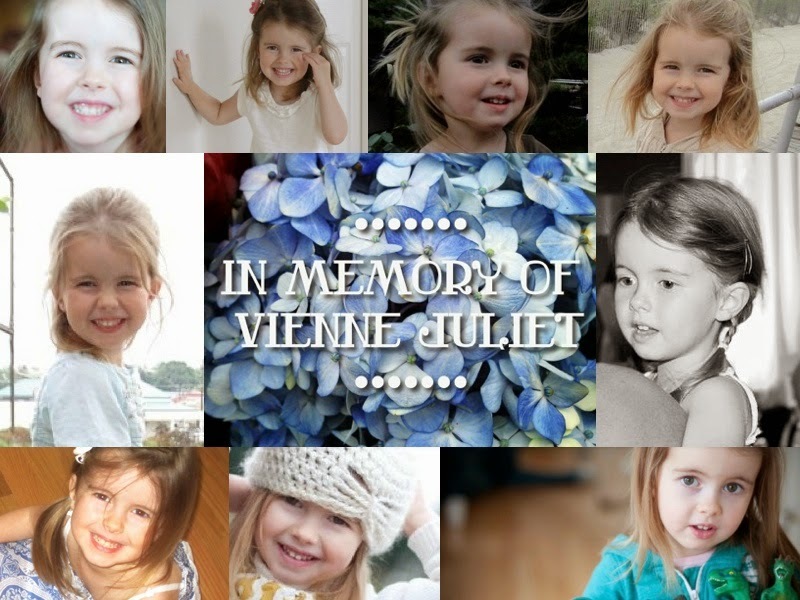 From here on out, there is so much of her missing - for 2013 is without Vienne, where 2012, at least, knew her. So, no, we are not anxious to move on from last year. We still hate the idea of moving on from her. I hate the idea that every day is further from her and that the memories grow a bit distant each time. I will confess that I have struggled much over the past week with the state that my heart is still in. I still hurt. I mean...of course. I am still angry. And, I still stubbornly reject the feelings of peace offered to me. I've started to compare myself to other mothers who have lost a child. I have discovered their blogs and read their hearts. And, it has boggled my mind how many of them have so much peace about it. They make those statements about how their precious baby is now dancing with Jesus and is safely in His arms. They are sad, but they have peace. And, I feel so lost...like I missed that train. I know I know...we all grieve differently. But, it is human nature to compare...and I'm just confessing that I have. I wonder "was my faith not strong enough when this happened?"... "was I too obsessed with my Vienne?" I know these are irrational thoughts. I am just processing. I don't want that peace because I am still not ready to be ok with the fact that she is gone. But, in the same light, I also know that I need that peace...even whilst I stubbornly reject it. Stupid cycles we go through. Over the past two weeks, I have experienced an obscene amount of stress and I have never been more aware of my need for peace. I guess I just don't know what that looks like yet. Another thing I have recognized over the past few weeks is just how severely traumatized I really have been from what happened. Every mother who loses a child has got to experience some amount of trauma from it. I feel haunted by the events of that morning. Every single one of my senses (sight, touch, taste, smell, and sound) was assaulted by the trauma of trying to revive her. And I can still see, feel, taste, smell, and hear it all, almost every night when I go to bed. I did not acknowledge the severity of all of this until just recently. Obviously, I am stuck. I realize that I am repeating some of the same thoughts that I've poured out before. I hate being redundant and it frustrates me to no end that I am such a "downer". Yes, I know I have full rights to be the ultimate downer...and I'm aware that this year will be heavy with that. But, I've never been a sad or depressed person and it is so hard for me to rarely have something good to report. You know? I finally found a Christian grief counselor in our area and we have an appointment next Wednesday evening. If you think of us, please pray that it is a good match. "If I get stuck and hurt, you've got to help me and fix me....the end." (the words in the middle are just her made up sing song words that she would insert into songs). I know that Mark has struggled enough, as it is, with feeling useless that morning because he was not home (of course, he was at work...but he still struggles with that). I'm sure you can understand why these words strike so hard. Reading this makes me wonder...are the parents who have lost a child really at peace? I mean, how could you be? I have a strong faith and I wouldn't be at peace. I think people tuck it away and just hope it gets better? I think the honesty that you reflect in this blog might be the healthiest way to get through the day. My heart will forever be changed since I started reading this blog. I wonder the very same thing. I know that it is difficult for most to be as raw as I have been. Thank you for such encouragement. Dear Jenny, I have been thinking about you and Mark these past few weeks. Reading your post today broke my heart.The lonliness in your words and thoughts is so raw and real I can feel it. I am so very sorry for you that you have been stuck with this burden no parent should ever have to endure. Please don't be hard on yourself and expect peace, how could you? My prayers are with you that the counselor is a good fit and brings you comfort. I think tour blog is a very healthy way to cope with what is devastating. Ivy is a beautifal baby and I can see Vienne in her eyes. Bless you, Mark and Ivy. Thank you so much, for such sweet words and encouragement. Even though you may not feel my presence. I AM holding you close under the shadow of my wings. Thank you, Jeannie, for taking the time to share this. It is beautiful. Still hard for me to read fully, but I am getting there. Thank you for not giving up your prayers. Freak. This video. And your aching heart. I can imagine how it still aches so so much. I am aching with you, still friend. Hugs and prayers for you always always always. Love you so much! I'm so sorry I was one of the ones that wished a good riddance to 2012 to you. I even thought about how much you would struggle with saying goodbye to a year that knew Vienne.... but selfishly I wanted 2012 to be gone. 2012 was too full of grief and hardship and I wanted so badly to think that maybe 2013 would have something better in it. But how could it for you? How could any year be better than the last year that knew your sweet Vienne. I'm sorry for my insensitivity. I sincerely hope this year brings you the peace you so desperately need. I hope your heart feels the release from that tight grip of grief and pain. I hope this counselor is a perfect fit and provides a space for you to process and begin to heal.... Love you friend. Oh Lacey ~ please no apologies. You were not one of the ones. You texted that you figured I might be feelings this way, as well. I know your heart, too. I love you my friend.